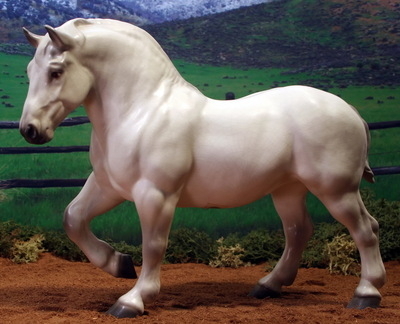 Note: Our Percheron breeding program uses the prefix "Ironwood". We would be honored if you use that prefix in your foal's name, especially when using one of our mares, but it is not required. 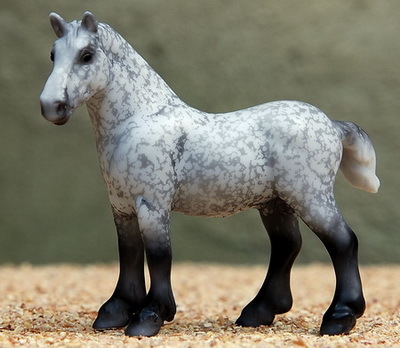 1993 grey Percheron, Hagen Renaker Mini ”Drafter” o.f. A gorgeous vintage HR, both his sire and dam are owned by Persimmon Hill Farm. Grand Champion, 2013 MEPSA Reserve Champion Belgian/Percheron (Mini), IMEHA Superior Champion, OFCC Bronze Medallion. 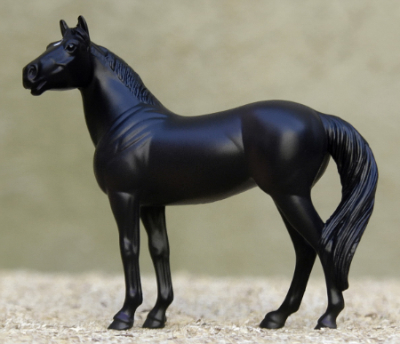 1994 black Percheron stallion, Breyer Kong OF. 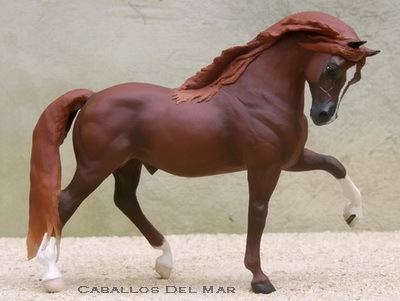 Marvelous Indigo Creek-bred stud, combining the best of model and real horse breeding. Reserve Champion in his first show, 2012 IPABRA Top Ten Drafter, IMEHA Supreme Champion, OFCC Bronze Medallion. 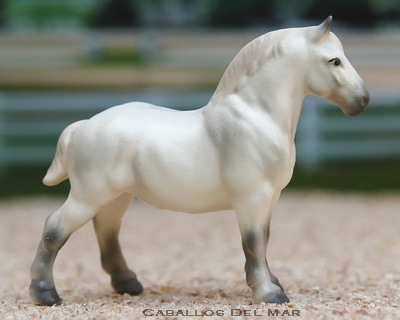 1995 grey (smoke) Percheron, Breyer ”Belgian” o.f. 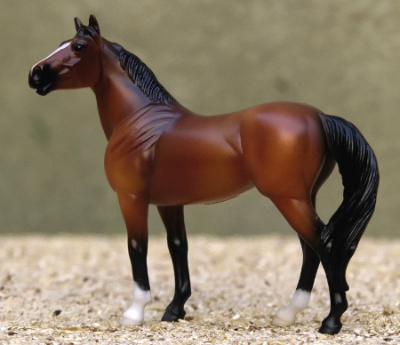 John is a wonderful example of the early Breyer models - marvelous, deep color, complete with eye whites. 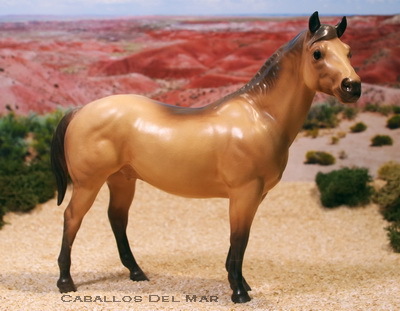 He is part of our original Breyer show string, multi-champion, IMEHA Supreme Champion, OFCC Bronze Medallion. 1999 dapple grey Percheron stallion, Eustis Standing Belgian CM. A grandson of our MGC showhorse in the 1980s, Castlesintheair, he's carrying on the family tradition with 11 Grand/Reserve Grands and over 100 Champ/Reserve Champ titles under his belt. 2013 MEPSA Champion Draft Type Stallion, Reserve Champion Belgian/Percheron, 2011 and 2012 IPABRA Top Ten Drafter, IMEHA Supreme Champion - Halter, Champion - Costume. 2000 grey Percheron stallion, Breyer SM G4 Vaulting Horse OF. Terrific model-to-real pedigree from Jean Sorensen/Lake Hill Ranch. Shown lightly, IMEHA Supreme Champion, OFCC ROM. 2009 dapple grey Percheron stallion, Eustis Trotting Percheron CM. Our second Eustis drafter, we look forward to him doing just as well - if not better - than his Grand Champion parents on our list. 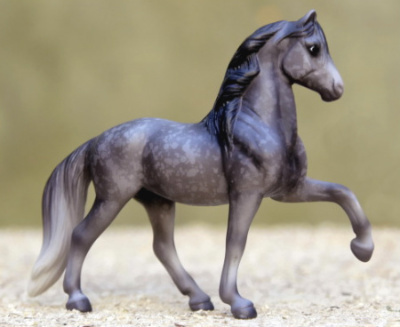 1994 grey Percheron mare, Breyer SM G3 Belgian OF. Nice real-bred pedigree from Carousel Farm, tracing to Justamere Showtime and D I D. Shown lightly, IMEHA Superior Champion, OFCC ROM. 2006 grey Percheron mare, HR Crusader OF. 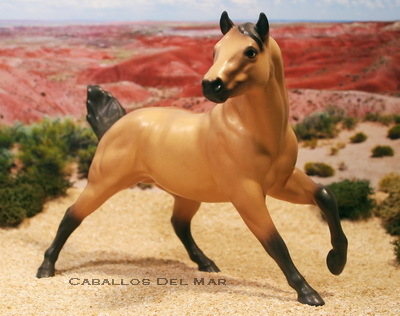 Bred by Caballos Del Mar/Dragon Star Farm, Carissa's pedigree is a great blend of real and model lines. Multi-Grand Champion, 2015 MEPSA Reserve Grand Champion Draft/Pony, IMEHA Supreme Champion - Halter, Superior Champion - Headstudy, Superior Event Award - Halter, Register of Merit, OFCC Silver Medallion (as Ironwood Carina). 2008 grey Percheron mare, Pour Horse Saucy. This gal has a great pedigree from Indigo Creek Stables and is taking her dam's place on our list. Multi-Grand, Multi-Champ, IMEHA Superior Champion - Halter, Champion - Headstudy, Superior Event Award - Halter (as La Rex Commanderette). 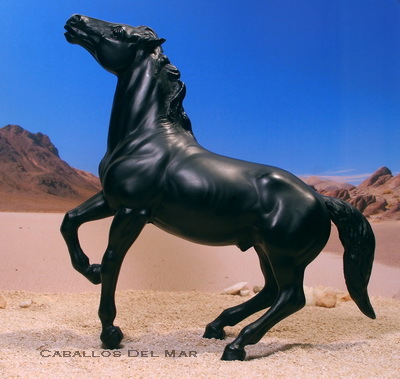 Note: Our Peruvian Paso breeding program uses the suffix "CDM". We would be honored if you use that suffix in your foal's name, especially when using one of our mares, but it is not required. 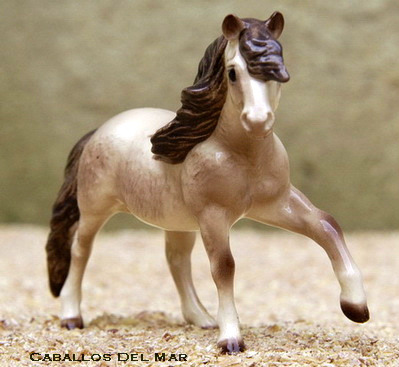 1991 palomino Peruvian Paso, Breyer "Peruvian Paso" o.f. Multi-Grand Champion in halter and performance. 2011 IPABRA Top Ten Spanish, 2013 MEPSA Reserve Champion Palomino, 2012 MEPSA Champion Palomino, IMEHA Paragon Champion - Halter, Champion - Headstudy, Other Costume, OFCC Silver Medallion. 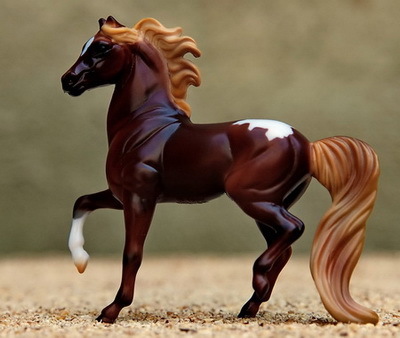 1992 chestnut Peruvian Paso, Breyer "Western Prancing Horse" CM into a dramatic gait. Multi Grand Champion, 2012 IPABRA Top Ten Spanish Breeds, IMEHA Superior Champion. 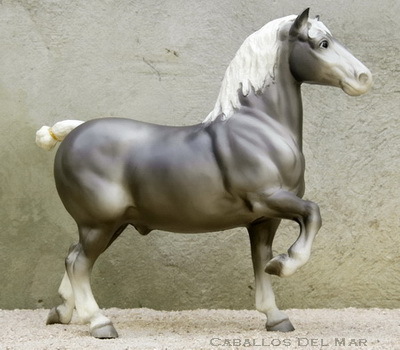 1993 grey (bay) Peruvian Paso stallion, Breyer SM G2 Paso OF. Sired by RyR Americo (full brother to RyR Galileo) before he was gelded, out of an imported granddaughter of AEV Regional. Shown lightly. 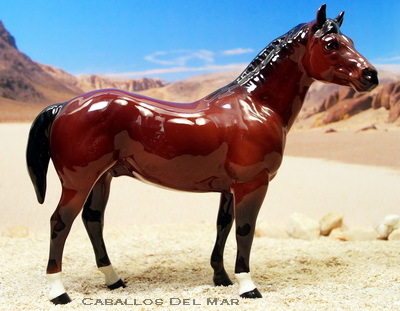 1994 chestnut Peruvian Paso, Breyer SM G3 “Peruvian Paso” o.f. His sire was the 6x U.S. National Champion of Champions Breeding Stallion and his dam is a full sister to another National Champion producing broodmare Genebre del Norte. Pacifico has the very best of the breed in his pedigree. Multi Grand champion, 2013 MEPSA Champion Other Pure Gaited, Champion Overall Gaited/Spanish Breeds, IMEHA Paragon Champion, OFCC Silver Medallion. 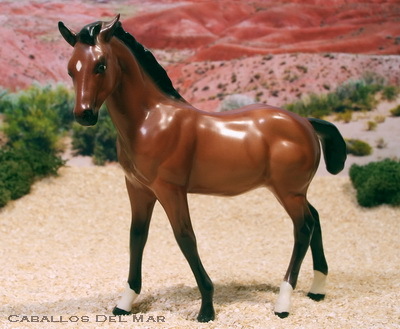 1994 chestnut roan Peruvian Paso stallion, Breyer SM G2 Paso OF. 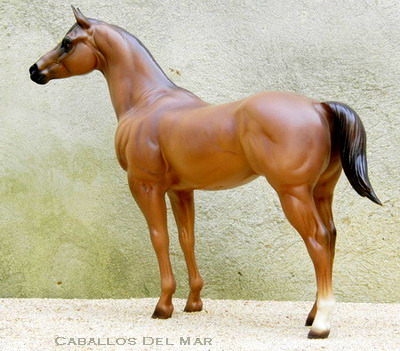 Another new face here at CDM, Deseno brings a real-horse pedigree along with his flashy color. 2013 MEPSA Reserve Champion Other Pure Gaited, IMEHA Supreme Champion, OFCC LOM. 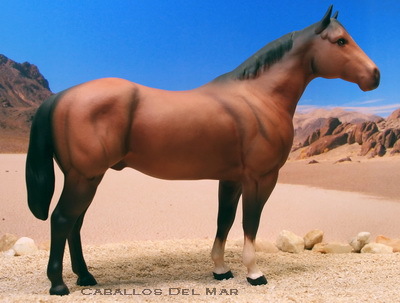 2000 dark chestnut roan Peruvian Paso stallion, Breyer Manco Capac OF. 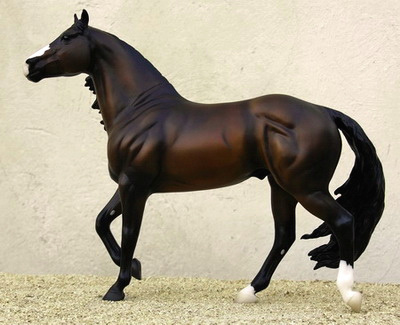 Gorgeous dark color on this real-horse-bred stallion. Shown lightly, multi-Champion, IMEHA Champion, OFCC ROM. 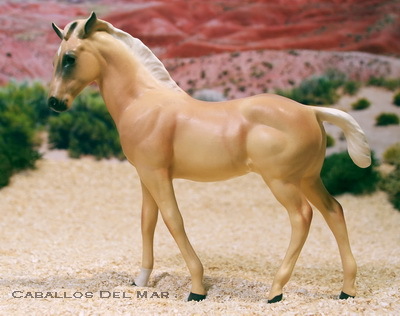 2003 palomino Peruvian Paso stallion, Breyer Western Prancing Horse OF. Bred by Cory Hartung/Double Hart Ranch, Pachacuti is named for an Incan ruler. He has a marvelous model-to-real pedigree. OFCC ROM. 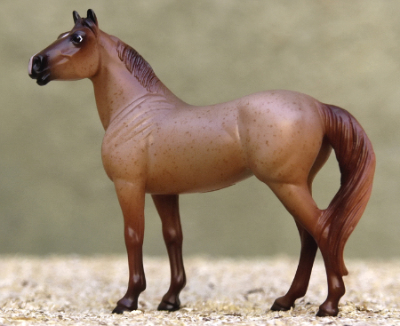 1995 chestnut Peruvian Paso mare, Breyer SM G2 Paso Target SR OF. Her sire, RyR Galileo, was a Peruvian National Champion Breeding Sire, and we thought it was appropriate to name her after the daughter of the real Galileo as a tribute. 2012 IPABRA Top Ten Spanish Breeds, IMEHA Superior Champion, OFCC LOM. 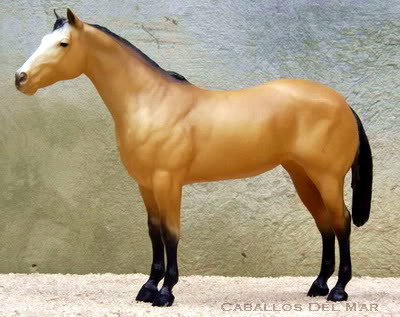 1997 buckskin Peruvian Paso mare, Breyer SM G3 Peruvian Paso OF. 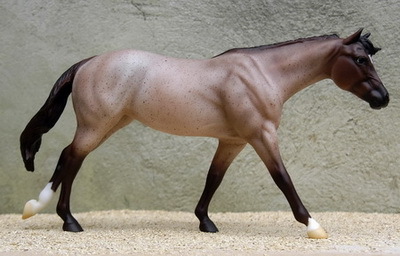 Gorgeous color to go with a gorgeous pedigree from Tracey Bartone/Shadow Wolf Stables. 2015 MEPSA Reserve Grand Champion Color (Mini), IMEHA Supreme Champion, OFCC LOM. 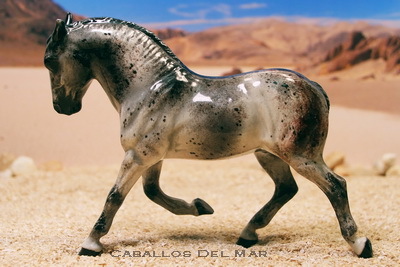 2001 grey Peruvian Paso, Breyer SM G3 “Peruvian Paso” o.f. 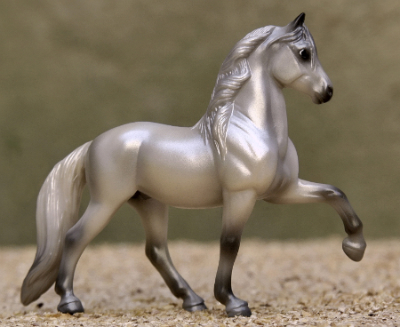 A beautifully pedigreed mare, Tiara is from the JCP "Parade of Breeds" set. Multi-Reserve Champion, IMEHA Supreme Champion, OFCC LOM. 2007 chestnut roan Peruvian Paso mare, HR Mini Highland Pony Stallion OF. Bred by Caballos Del Mar/Rocket City Stables, Noche takes the place of her dam on our list. IMEHA Superior Champion, OFCC LOM (as Primabella AAG). 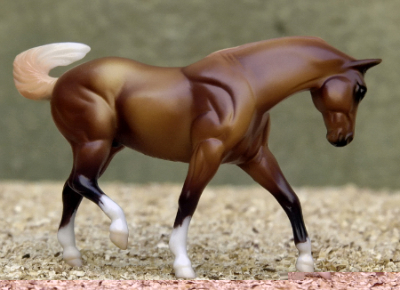 1994 bay/blanket POA, Breyer SM "Native Dancer" o.f. SR. Bred by Double Hart Ranch, Aquilus has a strictly model-bred pedigree. Shown lightly, IMEHA Champion, OFCC ROM. 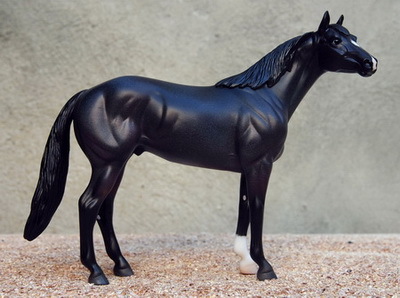 1995 black blanket POA stallion, Breyer SM G3 Mustang OF. 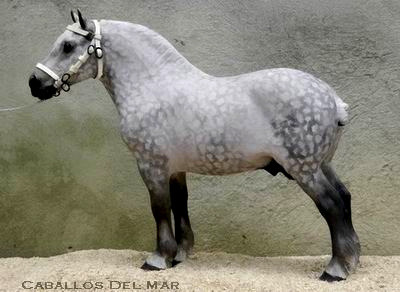 Nice real-horse pedigree with a mix of old-style Appaloosa and POA bloodlines. Shown lightly, IMEHA Champion, OFCC ROM. 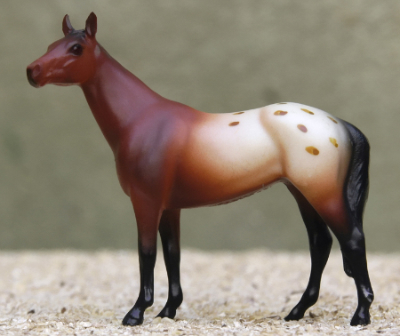 1995 chestnut few spot leopard POA stallion, Breyer Newsworthy Vintage Club 2014 OF. Mostly model-bred pony from Double Hart Ranch's program. Shown lightly. 1996 bay roan blanket POA stallion, Breyer SM G2 Rearing Arabian "Eagle" SR OF. 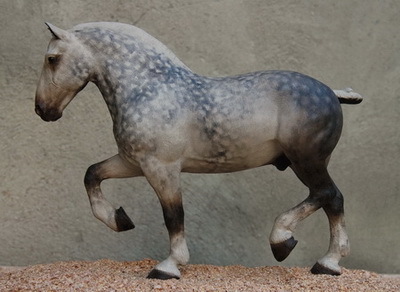 Royally bred stallion, Marksman is the Breyer 2012 Vintage Club "suprise", one of 500 made in the old Appaloosa Performance Horse colorway. Shown lightly, Grand Champion, IMEHA Champion, OFCC ROM. 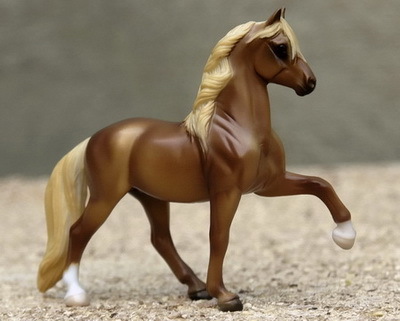 2002 flaxen chestnut snowcap POA mare, Breyer SM G2 Prancing Morgan OF. This girl's sire is owned by Heather Mays/Green Mountain tables and has a great model-bred pedigree. Her dam is our own home-bred Arabian mare - Arabians are an approved outcross for the ApHC - giving her a wonderful refinement. Unshown to date. 2008 dark bay blanket POA mare, HR QH Mare OF. Terrific model-to-real pedigree. Champion, IMEHA Superior Champion, OFCC LOM (as KSS Double Cat). 1991 buckskin QH, HR DW “Two Bits” o.f. Trey is a full-sized half brother to our Quarter Pony stud, Triple Play. Grand Champion, IMEHA Supreme Champion, OFCC Bronze Medallion. 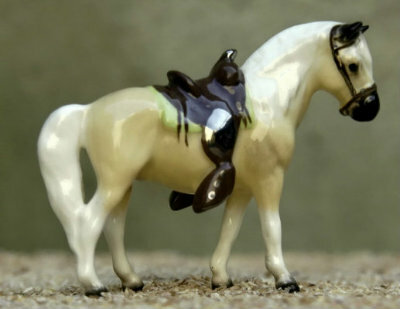 1992 bay QH, Beswick “Quarter Horse” o.f. glossy. 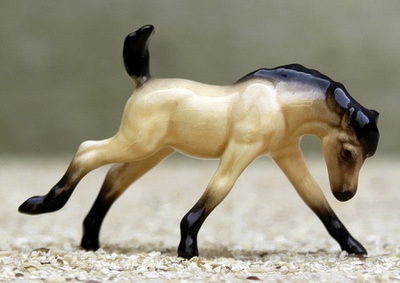 When I first saw a photo of one of the Beswick QHs, I was quite taken by the old-style “bulldog” appearance of this model. Mariachi continues the legacy of his father, adding in the more modern QH bloodlines through his maternal grandsire, Zippo Pine Bar. IMEHA Superior Champion, OFCC LOM. 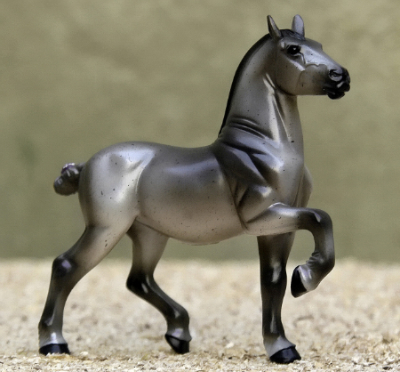 1992 grey QH, HR Mini “Quarter Horse Stallion” o.f. glossy. Beautiful re-release of this model with great color and shading. Grand/Reserve Grand, Multi-Champion, IMEHA Superior Champion, OFCC LOM. 1993 bay QH, HR DW “Two Bits” o.f. glossy. 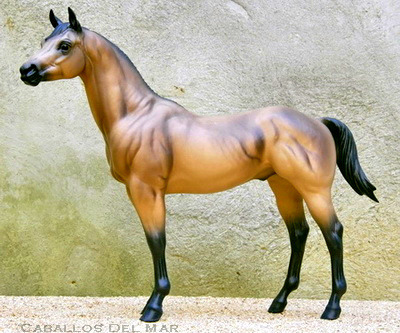 When HR began re-releasing some of their DW horses in the mid-80s, I usually bought the matte versions. This guy is one of the exceptions - I really love his beautiful color. Shown lightly, Champion, IMEHA Supreme Champion, OFCC LOM. 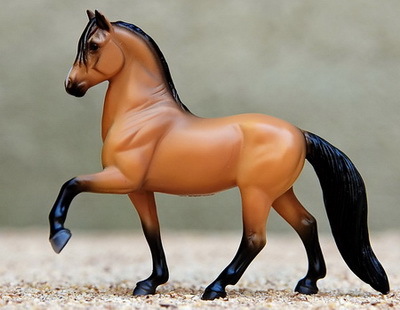 1994 chestnut QH stallion, Breyer Classic AQHA Stallion OF. Bred by Indigo Creek Stables. Gorgeous color, IMEHA Supreme Champion, OFCC ROM. 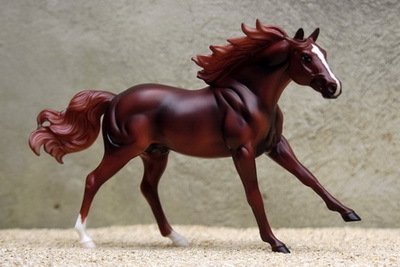 1994 chestnut roan QH stallion, Breyer SM G4 Para Dressage OF. Some good working cow lines in this guy's pedigree. IMEHA Champion. 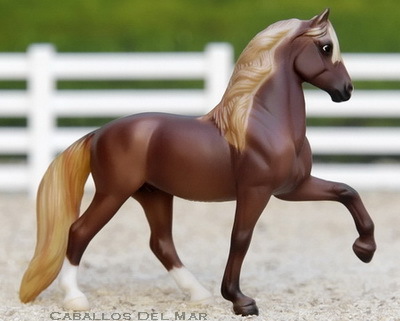 1995 chocolate palomino QH stallion, Breyer Adios Vintage Club 2014 OF in glossy charcoal. 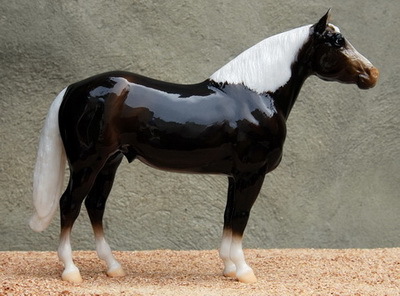 The color on this horse is gorgeous - not black, but a deep, dark brown with white mane and tail. 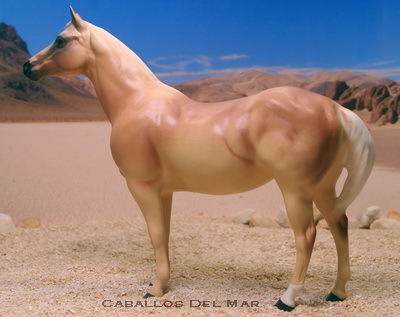 He is a full brother to The Coolest Thing®, a real chocolate palomino mare. Unshown to date. 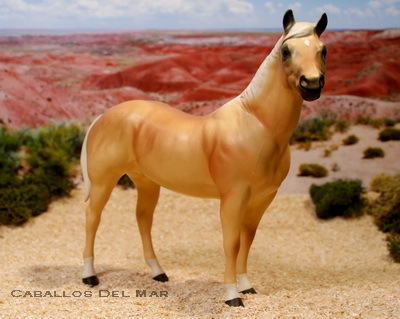 1995 palomino QH stallion, Breyer Breeds of the World QH Resin OF. Simply outstanding model-bred pedigree, tracing to real. Bred by Delana Metcalf/Foxfire Farm. Shown lightly, 2015 MEPSA Reserve Champion QH (Mini), IMEHA Champion, OFCC LOM. 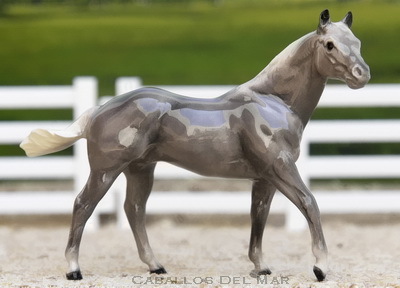 1996 grey QH stallion, Breyer SM G2 Appaloosa OF. Bred by Oklahoma State's fine program, Slide has a great working horse pedigree. IMEHA Supreme Champion, OFCC LOM. 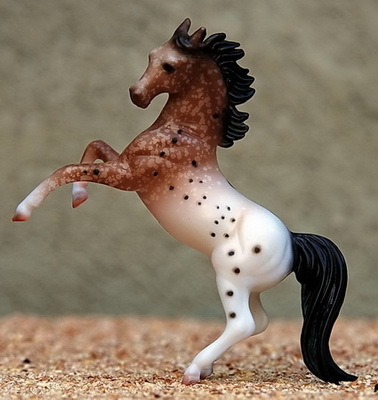 1996 chestnut QH stallion, Breyer SM G2 Appaloosa OF. 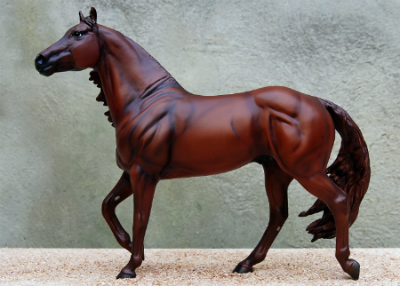 Pedigree by Erin Logan of Red Wolf Ranch with terrific model and real-bred horses on both sides. Unshown to date. 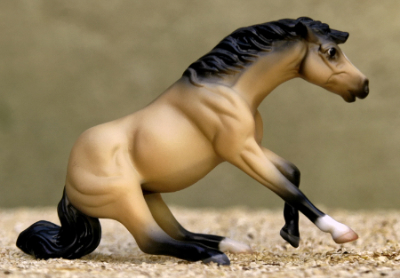 1996 grey (black) QH stallion, Breyer Premier Club "Wyatt" 2014 OF. 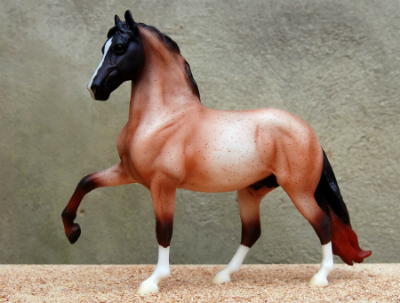 This is the first Premier Club release for 2014, sculpted by Morgen Kilbourn. Gorgeous dappled rose grey. Bred by Cindi Nakagawa/Indigo Creek Stables, he has a great pedigree for any number of cow or sporting events. OFCC ROM. 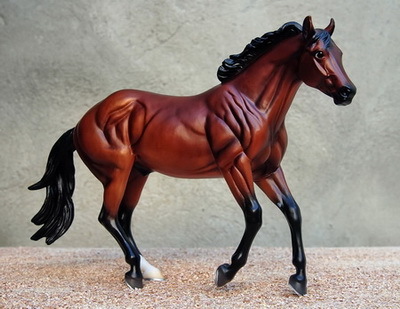 1997 chestnut QH, HR Mini “Quarter Horse Stallion” o.f. glossy. 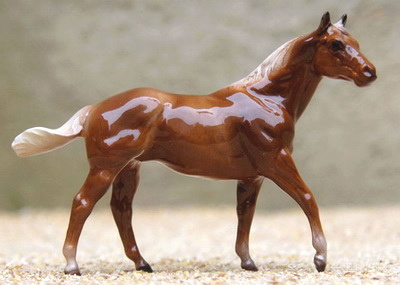 The newest re-release of this model, Bottle Shock is bred by Ryan Jaegers/Missouri Breaks Ranch. Shown lightly, Grand Champion, Multi-Champion, IMEHA Superior Champion - Halter, OFCC Bronze Medallion. 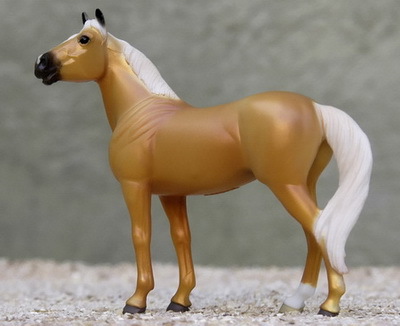 1997 buckskin QH stallion, Breyer SM G4 WEG Reining Horse OF. Nice reining pedigree, with some terrific old-school names. IMEHA Premier Champion, OFCC LOM. 1997 palomino QH, HR DW “Topper” o.f. glossy. Mister Gold Olena takes the place of his sire in our herd, adding two more great families of cows and speed through his dam, a Doc Olena daughter and Jet Deck grand-daughter. Grand Champion, 2015 MEPSA Reserve Champion Palomino, IMEHA Superior Champion, OFCC LOM. 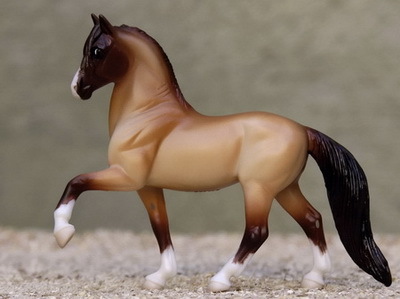 1998 dun QH stallion, Breyer Zippo Pine Bar "Picture Perfect" OF. 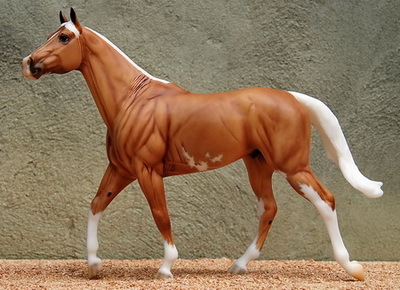 Beautifully bred by Eileen O'Dell/Painted Pony Ranch. IMEHA Supreme Champion, OFCC LOM. 1998 buckskin Appendix QH, HR “Metalchex” o.f. If you're breeding for speed, Hype is a great package. We crossed his palomino QH father (see below) with one of our TB A.P. Indy daughters to get both color and form. Multi-Grand, Multi-champ, 2012 IPABRA Top Ten QH, 2012 MEPSA Champion QH, Reserve Champion Stock Type Stallion, Champion Buckskin/Dun/Grulla, IMEHA Supreme Champion, OFCC Silver Medallion. 1999 palomino QH, HR DW “Two Bits” o.f. 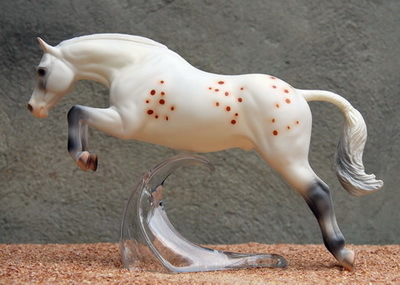 This was one of the first special runs that Hagen Renaker produced. 2015 MEPSA Reserve Champion HR, IMEHA Superior Champion, OFCC Silver Medallion. 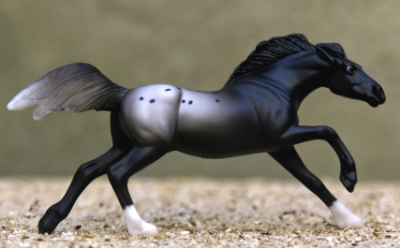 1999 black QH, Breyer “Mustang” o.f. Special Run. This model was one of the first special runs that our hobby saw. He was released through Bentley Sales Company in 1978 with only 200 made, and we bought him directly from them. One of only 14 original finish Breyers that were retained in our collection. 2015 MEPSA Reserve Champion Stock Type Stallion, IMEHA Supreme Champion, OFCC LOM. 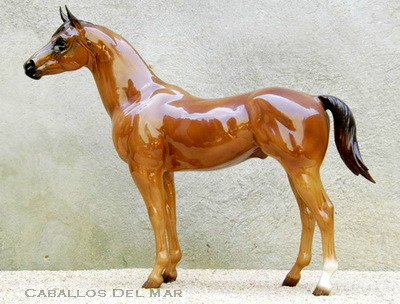 1999 dun QH stallion, Breyer SM G3 Rearing Andalusian OF. Bred by Foxfire Farm, Major carries bloodlines from Yellowstone Valley's and Zodiac Farms' excellent program, tracing to a who's who of real QHs. IMEHA Supreme Champion, OFCC LOM. 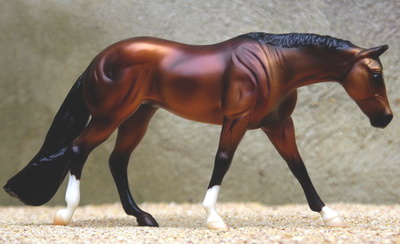 1999 chestnut QH stallion, Breyer Topsails Rien Maker OF. If you want to see the great names of the QH breed, look no further than this guy's pedigree. Reserve Grand Champion, IMEHA Premier Champion, OFCC ROM. 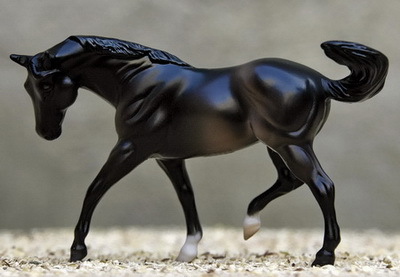 2000 black roan QH stallion, Breyer Classic Ariat OF. Bred by Foxfire Farm, this guy has a terrific model to real pedigree and is a descendant of Marney Walerius' Poco's Bucketsful of Trouble. Unshown to date. 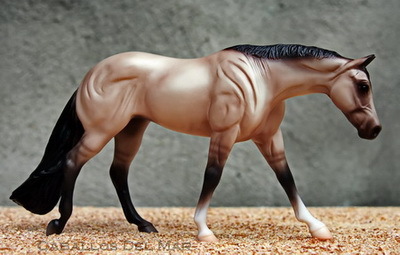 2001 bay QH, Breyer “Smart Chic Olena” JCP 2010 SR o.f. OK, so we were having a bit of fun with his name! A beautiful horse, and talk about an impressive pedigree! Sired by Ryan Jaeger's Everyonesgaynowdays, top sire of model QH racehorses, Donny is a half brother to 2010 AQHA Champion Senior Working Cowhorse, Shine Smartly. Looking for a reining/barrels/cowhorse with extra speed, he's your guy. IMEHA Premier Champion, OFCC LOM. 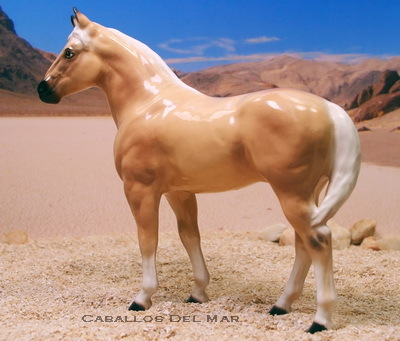 2001 palomino QH, Breyer Classic “Hollywood Dun It” o.f. Another great reining/working cowhorse pedigree, this time from Indigo Creek Stables. Multi-Champion, IMEHA Supreme Champion, OFCC LOM. 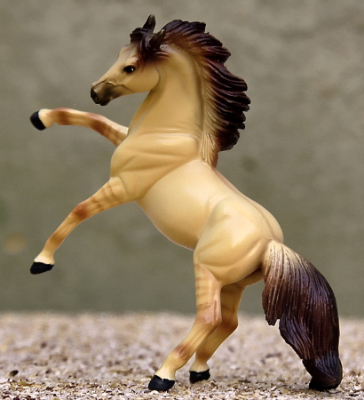 2003 buckskin QH stallion, Breyer Fighting Stallion "King" SR OF from the Breyer Vintage Club Collection. Bred by Kathy Dodson/Me-Dow Stables, he has a terrific combination of model and real lines. 2015 MEPSA Champion Stock Type Stallion, IMEHA Champion, OFCC ROM. 2003 chestnut QH stallion, HR Metal Chex OF. Bred by Green Mountain Stables and sired by our First Down Dash son, Double Hot takes the place of his daddy on our list. IMEHA Superior Champion, OFCC LOM (as Hot Ticket). 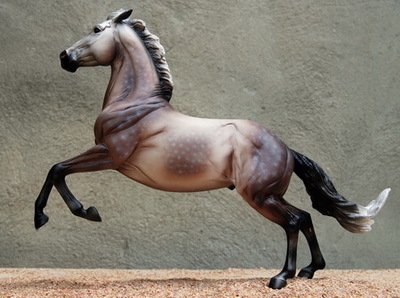 2003 bay QH, Beswick “Quarter Horse” o.f. 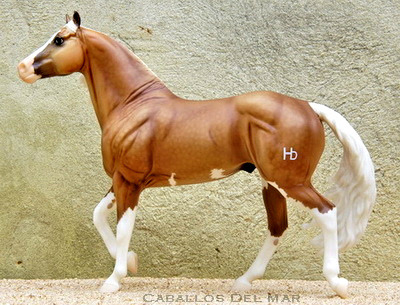 Jalisco is the matte version of the terrific "bull-dog" style Beswick QH, a much lighter color than his glossy sire (above). His dam, a Smart Chic Olena daughter, puts an additional stamp of cow sense on this young stallion. Multi-Champion, 2013 MEPSA Reserve Champion QH, IMEHA Superior Champion, OFCC Bronze Medallion. 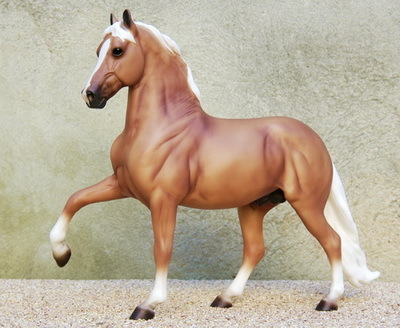 2004 palomino QH, Breyer “Big Chex To Cash” o.f. 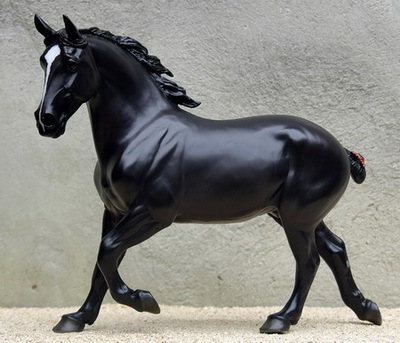 One of our first new Breyers in 20 years, we couldn't resist this beautiful horse. He is sired by our own Heza Dun Deal out of an NRHA World and Youth Champion (via embryo transfer). Multi-Grand, multi-Champ, 2012 IPABRA Top Ten QH, IMEHA Paragon Champion - Halter, Superior Champion - Headstudy, Superior Event Award - Halter, OFCC Bronze Medallion. 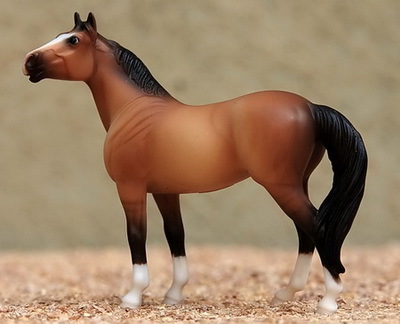 2005 bay QH stallion, Breyer Harley D Zip OF. The son of two of our great show horses, we expect big things from this beautiful bay stallion. Just beginning his show career, OFCC ROM. 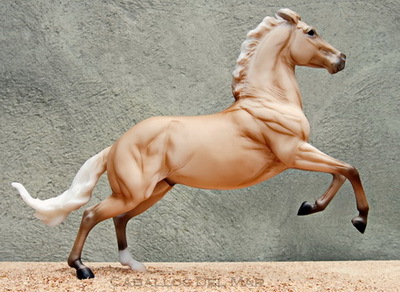 2007 palomino sabino QH stallion, Breyer Premier Club Carrick OF. This excellent young stallion brings together two of our model QH lines, combining outstanding reining/cutting pedigrees with the great Two Eyed Jack and Go Man Go. This is the matte version of Carrick, and we recently started showing him. IMEHA Champion, OFCC LOM. 2007 bay QH stallion (shown as a foal), HR Shamrock OF. Another one of our great Heza Dun Deal sons, out of our Zippo Pine Bar daughter. 2015 MEPSA Reserve Champion Stock Type Colt, IMEHA Superior Champion, OFCC Bronze Medallion. 2008 palomino QH stallion, HR Shamrock OF SR, one of 25. His parents are on this list, but he's made a name for himself in the showring. Reserve Grand, multi-Champion, 2012 IPABRA Top Ten QH, IMEHA Supreme Champion, OFCC Sapphire Champion, IPABRA Supreme Champion. 2008 buckskin QH stallion (shown as a foal), HR Mini Head Down Yearling OF. Terrific show horse, Multi-Grand Champion, IMEHA Champion, Superior Event - Halter, OFCC Silver Medallion. 2008 bay QH stallion (shown as a foal), HR Shamrock OF. A son of our own Mariachi Bars, this little guy is a great combination of model and real bloodlines. Multi-Champion, IMEHA Superior Champion, OFCC Bronze Medallion. 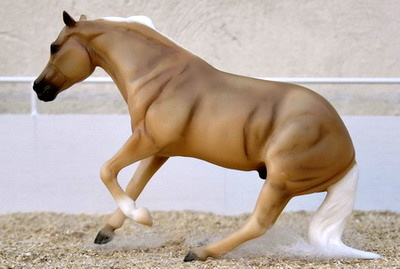 2009 sooty palomino QH stallion, Breyer Wyatt "Jesse" TSC 2015 SR OF. Tremendous reining pedigree from Indigo Creek Stables, Paychex is unshown to date. 1994 bay QH, HR DW “Erin” o.f. glossy. This little lady has it all – mobility and cow sense from her daddy, with the speed and soundness of her maternal grandsire, Goldseeker Leo. She is the dam of our multi-Grand champion Mule, Max Headroom, and multi-Champion show horses Jalisco and Heza Chic Charro. IMEHA Premier Champion, OFCC LOM. 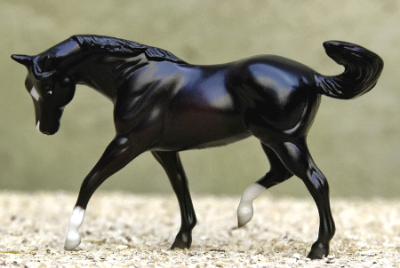 1995 smoky black QH mare, Breyer SM G3 Standing Stock Horse OF. A daughter of the great Shining Spark, Glo carries the dilute gene as well as all that great cow sense. Shown lightly, IMEHA Premier Champion, OFCC ROM. 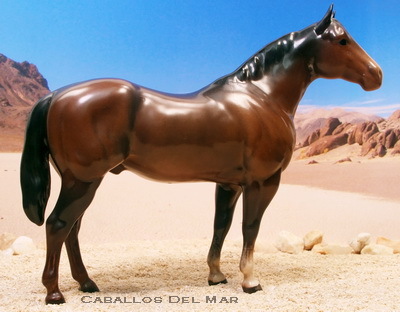 1996 bay QH, Breyer Classic “AQHA Mare” o.f. Sired by the number one Cutting Horse sire and out of a daughter of Dash For Cash, Cat has athlete stamped all over her. Amazing color! Multi Grand Champ, IMEHA Paragon Champion, OFCC Bronze Medallion. 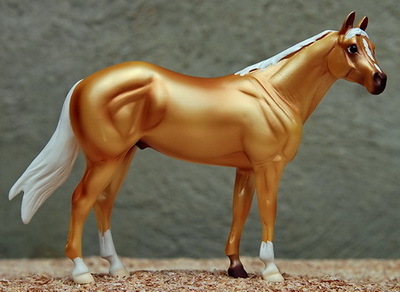 1996 palomino QH mare, Breyer SM G3 Standing Stock Horse OF. Bred by Heather Mays/Green Mountain Stables, her pedigree spans some of the great model and real QH breeding programs. Unshown to date. 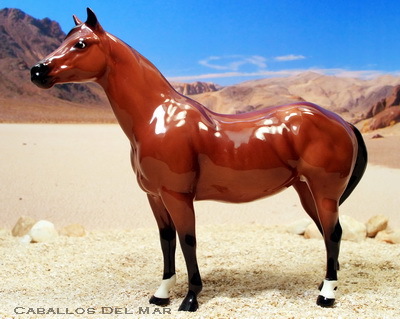 1997 bay QH mare, Breyer SM G3 Standing Stock Horse OF. What a great working pedigree! Smart Little Lena and King Fritz on the top with Nu Cash and Peppy San Badger on her dam's side. And quite a little looker, if we do say so ourselves. 2013 MEPSA Reserve Champion Stock Type Mare (Mini), IMEHA Superior Champion, OFCC ROM. 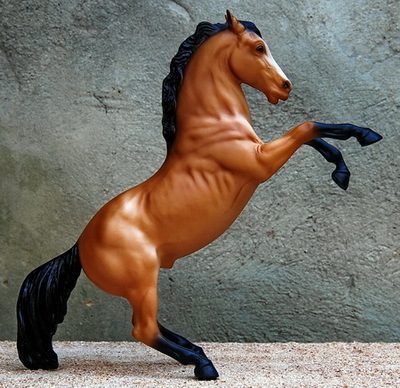 1997 chestnut roan QH mare, Breyer SM G3 Standing Stock Horse OF. What do you get when you breed Peptoboonsmal to a daughter of Smart Little Lena/grand-daughter of Dry Doc? Well...WOW! 2013 MEPSA Champion Stock Type Mare, Champion QH (Mini), IMEHA Supreme Champion, OFCC ROM. 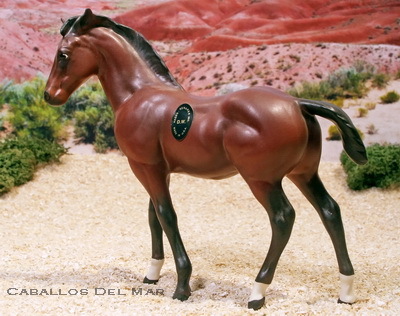 1998 bay dun QH mare, Breyer Classic AQH Mare OF. Beautifully bred by Randa Garrett/Twin Springs Stables, Jessie has some great model breeding from Indigo Creek Stables and Lake Hill Ranch, all tracing to real. Just beginning to show. 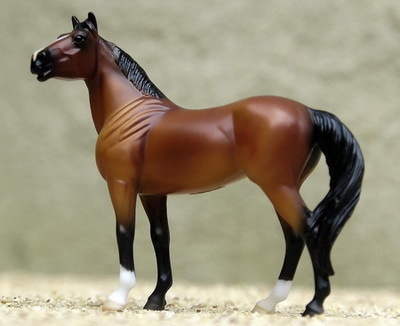 1998 bay dun QH mare, Breyer SM G3 Standing Stock Horse 2007 JCP SR OF. Beautifully bred by Cindi Nakagawa/Indigo Creek Stables, this mare brings a great reining pedigree to the table. And she's a stylish dresser to boot! Multi-champion, IMEHA Champion. 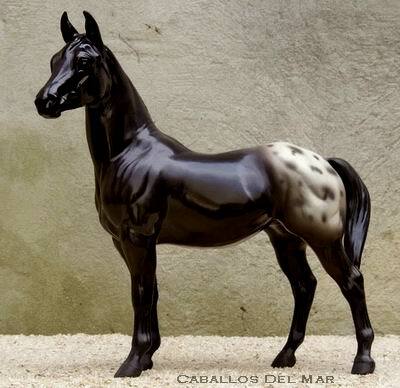 1998 dark bay QH mare, Breyer SM G2 Appaloosa OF. Own daughter of Reminic, this pretty girl has a smart reining horse pedigree. IMEHA Premier Champion. 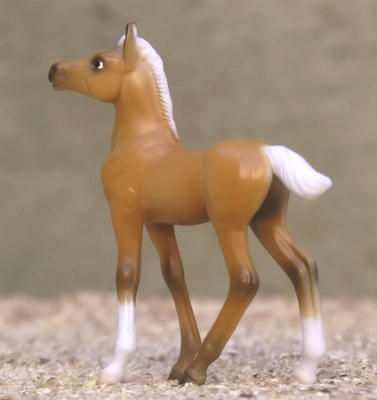 1999 buckskin QH, Breyer “Lady Phase” o.f. (bald face). 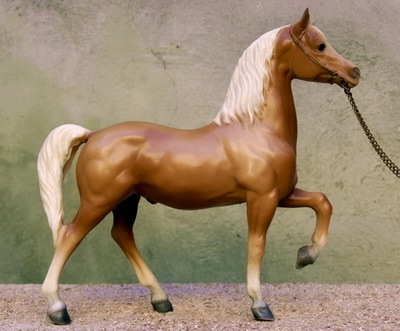 "Daisy" is from the 1980 Model Horse Congress special run of 100 models, one of only 14 original finish Breyers that were retained from our original collection. Multi-champion, IMEHA Supreme Champion, OFCC Bronze Medallion (as Two Eyed Dancer). 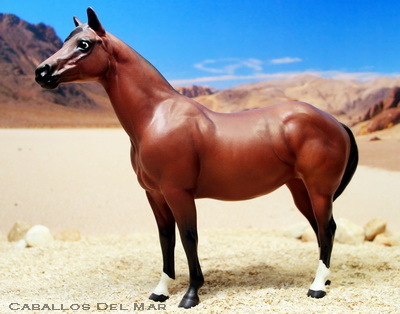 2000 red roan QH, Breyer Classic “AQHA Mare” o.f. Her name describes her breeding - working cow horses all the way. Multi-Grand Champion, IMEHA Paragon Champion, OFCC Bronze Medallion. 2000 bay QH, HR DW “Erin” o.f. Sired by top AQHA Reining Sire, Top Sail Whiz, Genie takes the place of her dam on our list. Really spectacular reining and working cowhorse bloodlines. IMEHA Premier Champion, OFCC LOM (as Zips Honey Bunny). 2002 chestnut QH, HR “Metal Chex” o.f. Sired by the 2009 Leading Sire of Racing QH's, Initialize takes the place of her multi-Grand Champion dam, Rubrica. With racing speed on both sides of her pedigree, she would be a great producer for speed event foals. IMEHA Premier Champion, OFCC Bronze Medallion (as Rubrica). 2002 palomino QH mare, HR Mini Western Horse OF. Sired by the #1 AQHA Leading Performance Sire, Nominee takes the place of her dam on the list. Unshown. 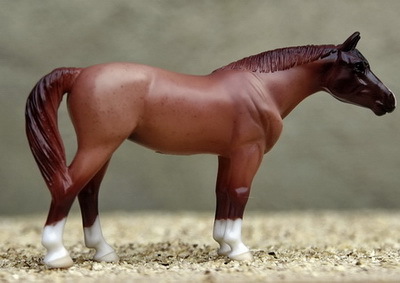 2003 chestnut rabicano QH mare, Breyer Roxy "Don't Look Twice" OF. Awesome cutting pedigree from Indigo Creek, with High Brow Cat, Smart Chic Olena, Doc Bar and Dash For Cash in her bloodlines. OFCC ROM. 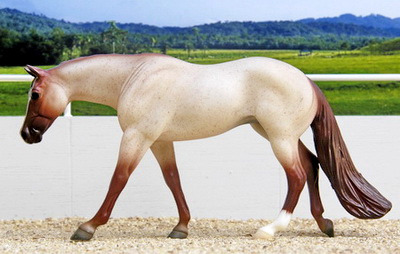 2004 chestnut roan QH mare, Breyer Bet Your Blue Boons OF. A homebred gal, How Now has a great model/real pedigree. Shown lightly, 2015 MEPSA Champion QH, 2012 IPABRA Top Ten QH (#1), IMEHA Supreme Champion, OFCC Bronze Medallion. 2006 palomino QH mare, HR Erin SR OF. Taking the place of her dam on our list, Galla Dash is a daughter of the #4 all-time leading reining sire and a granddaughter of the immortal Dash For Cash. MEPSA 2015 Champion Palomino, IMEHA Premier Champion, OFCC Bronze Medallion (as Ms Dash For Dinero). 2006 buckskin QH mare, BSO. Bred by Trish Yanko/Rivendale, Kantishna is a great blend of old-time model and real lines. 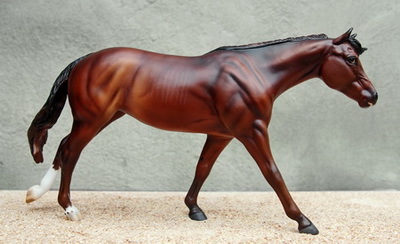 2009 bay QH mare, Breyer SM G3 Standing Stock Horse OF. Great model/real-bred pedigree, Nicky takes her dam's place on our list. IMEHA Supreme Champion, OFCC ROM (as Peppers Lil Lark). 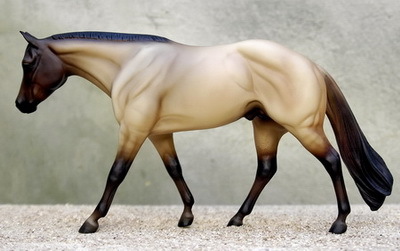 2010 palomino QH mare (shown as a foal), Breyer SM G3 Standing Foal OF. This cute gal's sire and dam are both on our list. Shown lightly, IMEHA Champion.